The stylistic approach employed by director/co-writer Aneesh Chagantry – that of having the movie screen show only what’s on a computer’s desktop – is both Searching’s greatest asset and its most significant drawback. Although observing various programs being opened and closed, peeking into someone’s social media accounts, and watching home videos may not seem like an inherently cinematic way to tell a story, it’s mostly effective – at least until late in the proceedings. At that point, with the narrative demanding an expansion from the confines of a computer screen, Chagantry is forced to pull in TV news broadcasts and security camera footage. 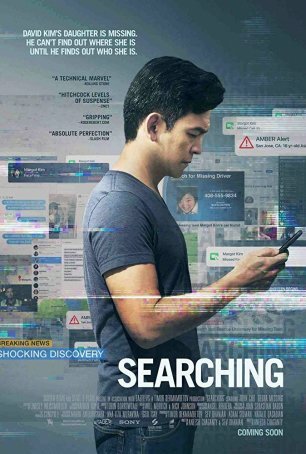 Searching is a taut, effectively paced mystery-thriller with a powerful emotional component. In addition to the Hitchcockian elements surrounding the disappearance of a high school girl, the film takes the time to develop the intra-family relationships using intimate videos. These chronicle happier times in the Kim family – times before David (John Cho) lost his wife, Pam (Sara Sohn), to cancer, thereby making him the sole parent for his daughter, Margot (Michelle La). We are exposed to a variety of candid moments during the opening credits, tracing Margot’s development from a cheerful young girl to the closed-off 16-year old we meet briefly via FaceTime before she disappears. For David, what happens with his daughter unfolds in an uncomfortably believable fashion. It’s every parent’s nightmare – the banality of everyday life suddenly becoming undone by the terror of loss. The sense of verisimilitude, enhanced by the way in which Chagantry presents the story, makes events seem real, and there’s an earned emotional underpinning that many thrillers lack. Although a close cousin to the “found footage” horror style (also used to middling effect in both Unfriended and Unfriended: Dark Web), this feels less like a gimmick and more like a legitimate storytelling device. As David’s nonchalance escalates to worry and eventually panic as he is unable to contact Margot, Searching coils us tighter than a spring. Eventually, when it’s no longer possible to blame a dead cell phone battery or an overnight camping trip into an area with no signal, David is forced to admit that something is very wrong. He files a missing persons report and is contacted almost immediately by the competent, helpful Detective Vick (Deborah Messing). Most of the film develops along traditional mystery lines as David combs through the electronic clutter left behind by his daughter, contacting her on-line friends and watching a series of web broadcasts that show a different side of her than the one he’s familiar with. He discovers things about her that he didn’t know but none answers the central question: Did she run away, was she abducted, or did something else happen? Is she alive or dead? Searching is as good at creating an emotional response as it is generating suspense. It does both effectively, although some of the needs of the genre cause the movie to overreach during the last 15-20 minutes. There’s something “tacked-on” about the resolution that had me wondering whether this represented the original vision of Chaganty and co-writer Sev Ohanian. For what it’s worth (and without giving anything away), I think the choice made in the film is the right one. For the actor best known as Harold (of the Harold & Kumar movies) and the rebooted Hikaru Sulu in the three latest Star Treks, John Cho proves capable of commanding the screen in this atypical format. As a father trapped by devastating circumstances, the actor shows a gradual unraveling, his composure breaking down. His face becomes gaunt, his eyes and expression zombie-like. His need to do something forces him out of his comfort zone and into areas that endanger the integrity of Vick’s investigation. As the movie unfolded, I tried to imagine how it might work if told in a more traditional fashion. It’s difficult to gauge because it would be difficult to paint such an intimate portrait of Margot’s inner life using conventional flashbacks. The shortcuts available to Chaganty by remaining rooted in the electronic realm allow him to deepen the mystery, enhance the characters’ backstories, and encourage a sense of audience participation. By using programs, applications, and websites everyone knows, Searching makes familiarity a critical tool. Quibbles about the resolution aside, this thriller engaged me on a level that few movies do, drawing me into the mystery with its voyeuristic perspective and not letting go until the closing credits.